ycas revoluta is an evergreen shrub that is native to Japan. Sago Palm is very slow growing and when young it is around 2-3′ tall at maturity it can reach up to 10′ tall. The leaves are dark green stiff and glossy, looking almost like plastic. The leaves are generally 2-3′ long but a mature plant can sport even bigger leaves. The growth form is rosette and with age this plant can have a trunk if it is trimmed up. If given enough room to spread Sago Palm will make a really nice specimen plant, just be patient! 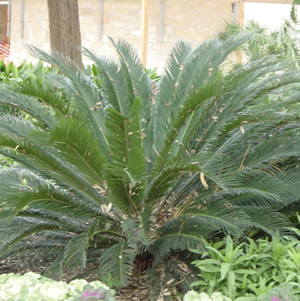 Sago Palm is not a true palm it is actually a cycad which is more closely related to conifers. This is why the flowers are cone shaped and there are both male and female plants.